The issue of Dhara Mustard Hybrid (DMH -11) has gained an importance recently. The issue possesses some concerns regarding the environment and ecology which might be asked in IAS Mains Exam 2017. So the IAS aspirant should not skip studying the topic during IAS preparation. 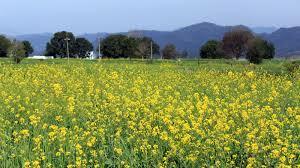 On 11th May 2017, Genetic Engineering Appraisal Committee (GEAC), the apex authority for genetically modified (GM) seeds has cleared the GM mustard for commercial release and use in farmer fields. But, the final approval is yet to come from the Ministry of Environment, Forest and Climate Change. If GM Mustard succeeds to get approval from the Ministry of Environment then it would be the first transgenic food crop to be allowed for commercial cultivation purpose in Indian fields and would be an opportunity for several genetically-modified food crops in India. The Recent decision of giving clearance by GEAC to a transgenic food crop for commercial purpose is not the first time. Earlier, the releases of Bt Brinjal was cleared by the same Committee in 2010 but was blocked by then Environment Minister, Jairam Ramesh, who cited, among other things, a paucity of safety tests. What is Dhara Mustard Hybrid (DMH -11)? (DMH -11) is the transgenic mustard has been developed by a team of scientists at Delhi University’s Centre for Genetic Manipulation of Crop Plants led by former vice-chancellor Deepak Pental under a government-funded project. In essence, DMH -11 uses a system of genes from a soil bacterium that makes mustard — generally, a self-pollinating plant — better suited to hybridisation than current methods. The activists of Coalition for GM-free India who is opposing the clearance of transgenic mustard hybrid DMH-11 say that its yield is no better than existing varieties. Approving GM mustard will force marginal farmers to buy seeds every season and it will affect their crop diversity and profitability. The group of opponents of GM mustard alleged GEAC for fixing of liability on crop developers for false/incorrect evidence provided wilfully to regulators in addition to violations of bio-safety norms laid down for field trials and blacklisting such applicants in the regulatory system. On several grounds, the civil society groups have been opposing the GEAC’s clearance to the GM Mustard including serious concerns with male sterility and herbicide tolerance and inadequate testing. Herbicides are chemicals used to kill weeds lead to an increased use of toxic chemicals on plants which in turn will adversely affect human and animal health as well as the environment. Nearly 50-60 % of the total honey produced in India is through the mustard crop and the honey producers opposing that GM crop using the technology will harm honey bees. The environmentalists and food experts have termed the GEAC's decision of approving the commercial use of genetically modified mustard, DMH11 as a “scientific sham”. The opponents have put some valid questions regarding the transparency and inadequate safety assessment took while conducting the research by Delhi University’s Centre for Genetic Manipulation of Crop Plants. The report available online is just the summary and the raw data is available with the concerned ministry in Delhi which must be available for all. It is very difficult for the person who is not residing in Delhi to get an access to the whole document prepared by the sub-committee set up by the MoEF. One of the valid questions put forward by the opponents regarding the constitutional provisional is that agriculture falls under the jurisdiction of the state list and the major decisions are taking by the Centre alone even though several states are opposing it, why? The opponents have highlighted several socio-economic impacts of introducing an herbicide-tolerant crop variety. A significant portion of the unorganised sector in India, especially rural women, is involved in manual weeding and it will impact on the rural women adversely. 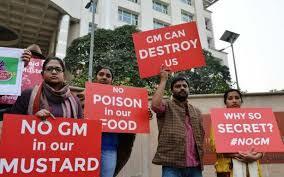 Coalition for a GM-Free India, a group of activists against GM crops in India alleges that developers of GM Mustard intentionally obscured that DMH-11 is an herbicide-resistant variety until recently and finally which was revealed only after continuous pressure and opposition. A series of opposition and disagreement from the food activists and farmers have made a concern and the Government should look into the matter seriously. The claim of 25% increase in the production of mustard by adopting DMH-11 looks not quite convincing and the researchers should also find out the traditional ways of improving the productivity of the crop in concern. When it comes to the transparency, the Government should also welcome the suggestions of the opponents which can help them to explore ill effects possess by the GM mustard, if any.